You can see the stars in a look, in a smile…Our inspiration are the millions of happy moments that we know people have on receiving FloraQueen’s gifts-surprises. This time, we have created a set in which joy and fantasy predominate. That’s why the bouquet comes in the brightest, warmest colours of the rainbow, yellow, orange and red. 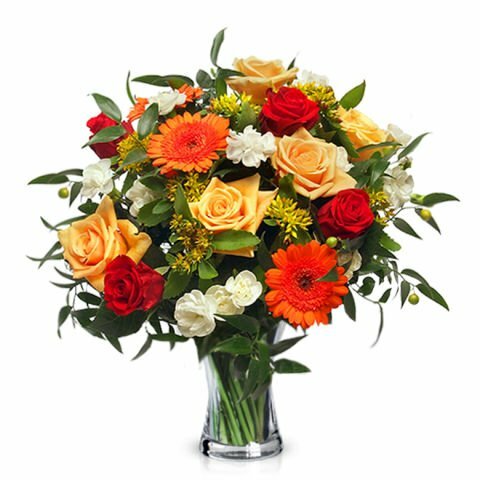 They’re orange gerberas, red and yellow roses and white flowers with a range of greenery. The second featured element of this pack is the jewels. She’ll wear this rhodium-plated chain with star motif, and a pendant of Swarovski glass with tiny encrusted stars. The earrings are the same as the pendant, a shining crystal decorated with small stars on each of them. The stars hold many secrets and hidden messages. 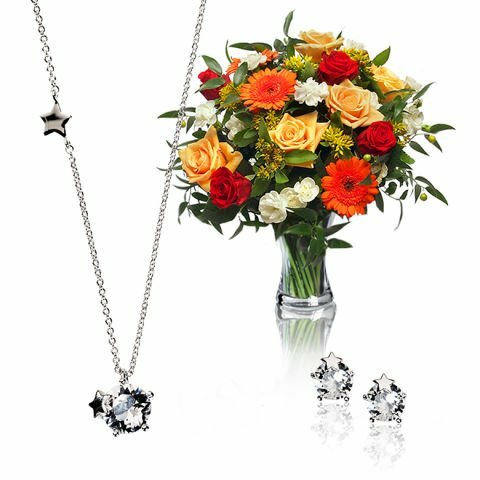 In this gift pack, you can send a personal, private message in the shape of a bouquet of fresh flowers in bright colours, such as orange gerberas, yellow roses and white blooms, together with set of necklace and earrings, with star motifs in Swarovski glass.